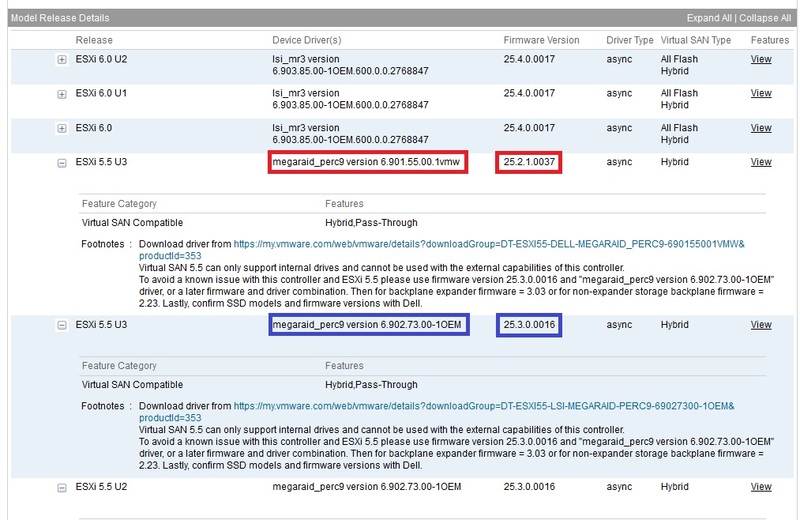 You will see that the controller listed here for ESXi 5.5U3 (Virtual SAN 5.5) has two different drivers and associated firmware versions, this is the explicit combination that is required, so for example it would not be supported to use the driver version highlighted in red megaraid_perc9 version 6.901.55.00.1vmw with the firmware version highlighted in blue 25.3.0.0016 and vice versa, this is the exact firmware combination that must be used.? So if you update the firmware of the controller, you need to also ensure you apply the correct driver version also. So what about newer versions you might ask?? Sometimes vendors will release newer Drivers and Firmware to provide fixes to known issues or enhancements to the controller, until that newer driver/firmware has been certified for Virtual SAN you should not upgrade to them, the chances are that it is in the process of being certified but until you see it on the Virtual SAN Compatibility Guide do not upgrade.? Stay Safe…..Stay Supported!